Most people who buy my work select finished paintings from my portfolio. However, about 40 percent of designers, art consultants and collectors want something special created just fpr them. That’s when I create a commissioned piece with subject, style, size and color palette that works for a given space. To discuss a commission, contact me by phone at 713-526-5538, or by email. We will arrange to meet and review the direction for your commission. We will also review pieces from my portfolio that you like. Once the direction is pinned down, I will create small color roughs of the planned painting for you to review. If desired, you may keep these roughs, as most people frame them. After you have approved a rough, I will paint a painting from all of the information you have provided. Before it is dry, I will invite you to view and approve the painting in case there are any minor changes to be made. Upon approval, we let the painting dry. Then you can arrange for framing — or I can work with you on farming and then arrange for my crew to install the piece when the work is complete. Burgess Loh Interiors contacted me about a client who needed a dramatic statement for the entry to her high-rise condominium. There was already a figurative sculpture in the corner of that space which had been purchased from Sotheby's in New York. The art needed to work with, and enhance, the sculpture. After reviewing my work online, the client and designer loved the concept of walking in the woods. This was accomplished by creating a diptych with the paintings installed at a 90 degree angle. The color palette also complements the rest of the client's floor-through space. Ingrao Inc., an architecture and design firm in New York City, contacted me about one of their clients who loved my work. 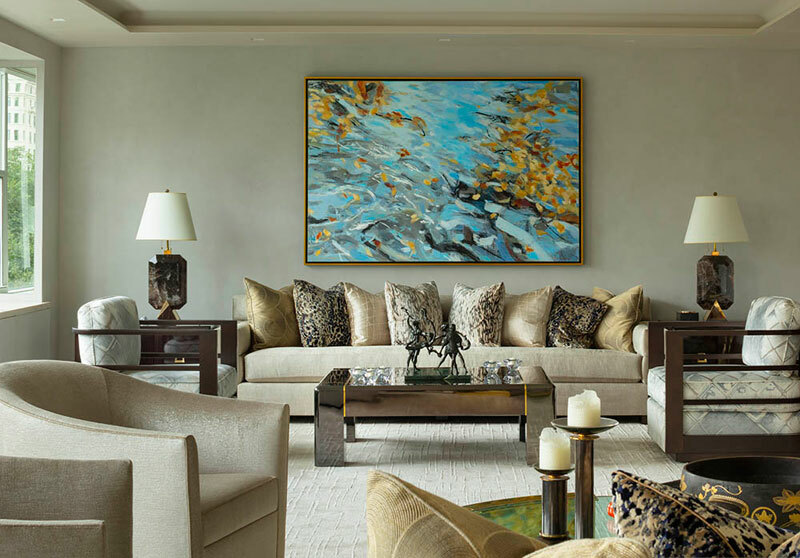 I worked direcly with them and their client to create a large painting for the living room of a floor-through condo on 5th Avenue. The collaboration was both fun and smooth. Once the piece was completed and approved, I also arranged for framing and shipping. 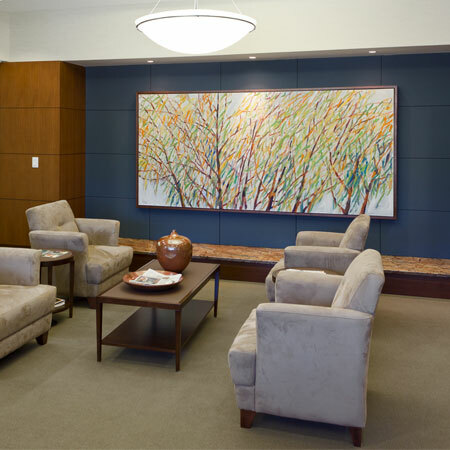 Kinzelmann Art Consulting in Houston contacted me about a client who needed two large-scale paintings for their headquarters. I met with the client, determined the subject, colors and dimensions for the pieces, then painted them. Upon approval, Kenzelmann arranged for transport and installation.